Today's Inspiration: BROOKS WILSON LTD. - The Paperback! 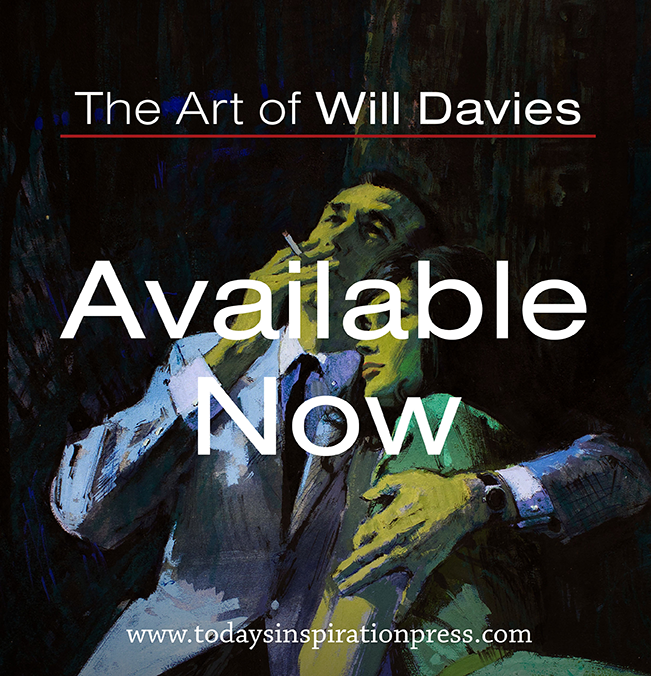 BROOKS WILSON LTD. - The Paperback! Years ago, I discovered a remarkable novel titled Brooks Wilson Ltd. written in 1966 by J.M. Ryan. 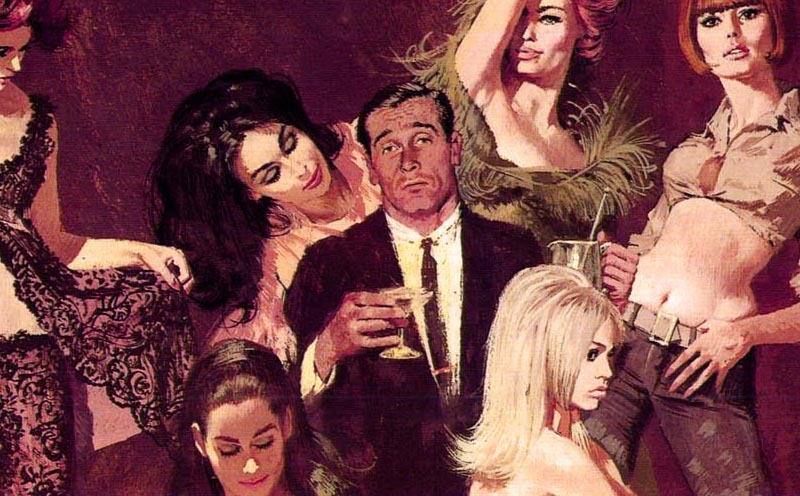 What initially attracted me to the book was the cover, adorned with one of Robert McGinnis’ best efforts; a wraparound that featured the titular hero (or anti-hero, as it turned out!) surrounded by a bevy of beauties. But what made this book truly fascinating was that Brooks is a freelance illustrator, and the story concerns his trials and tribulations right when photography was ascendant, and the life of an illustrator was fraught with uncertainty - kinda like today! A mid-level illustrator, Brooks struggles with work, his wife and kids, numerous affairs both real and imagined, the commute to NYC, and the ever-present bottle. If he can just nail The Big Account (for Lepridon, a fictitious truckmaker) all will be well, but he’s kept on hold by his agent, who we discover has also been repping photographers. Guess who gets the account! "Brooks, they don’t feel the guy’s hat sits on his head right. It looks O.K. to me, but they feel it isn’t right. I don’t know what to tell you." "Brooks, the client wasn’t happy with it and it ain’t gonna run after all. They want to know if you’ll play ball and settle for half price. You’ve gotta see their side of it." "Brooks, as near as I can figure, you bitched up the job by doing what he told you to do." The attention to detail about fees (usually paltry, with endless revisions built in), billing (90 days net! ), and the cut-throat culture of the industry is quite amazing. Again, it’s weird how little has changed! It turns out that J.M. Ryan is the pseudonym of Jim McDermott, an in-betweener at Disney way back in the 1930s. He obviously didn’t enjoyed the experience (he was there during the strike) and made that plain in his follow-up novel, The Rat Factory, a very unsubtle indictment of life working for The Mouse. Which begs the question; what was McDermott up to during the intervening decades, and just how autobiographical is Brooks Wilson Ltd.? Tomorrow: Brooks Wilson Strikes Back, the feature film directed by Irving Kirshner! Great post! Do you know if every edition features that same cover art? @Jesse: I think there was only one edition. The cover might be reproduced in one of the two book on McGinnis. @Ken, I didn't like the writing towards the end but all the way thru it's a great read/take on life during that era and what it was like to be an illustrator. I often wonder how much of it was from McDermott own life or embellishment based on the life of others. Anyway, I'm surprised it was thought good enough to be made into a film. Even though it's not the best writing (kind of like my comment here!) it's something worthwhile reading for any illustrator. And it is funny in a VERY dark way. Somehow reminds me of that Jimi Hendrix "Electric Ladyland" album cover. Dude looks just like Don Draper! Same lifestyle too. The cover reminds me of a 007 cover but I guess anything of that vintage with women and a guy in a suit would too. I'm reading Rockwell's "My Life as an Illustrator" and it too is very revealing and real life. I must get a copy of "The Rat Factory". Good stuff. Apparently this was filmed as LOVING in 1970 starring George Segal, going to have to find that one. Mr. McDermott was also a Marine Combat Artist, who served both in WWII and in Vietnam.